HAVE A think, how many scarves do you own? How often do you wear a scarf? 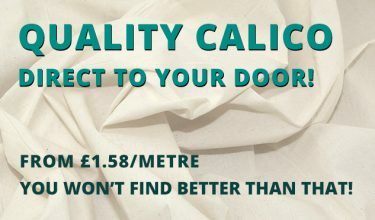 And how much would you pay for a designer scarf that makes you feel different, special and becomes a treasured possession? The scarf as a fashion accessory is bigger than ever (the skinny scarf is set to be big for spring, apparently). 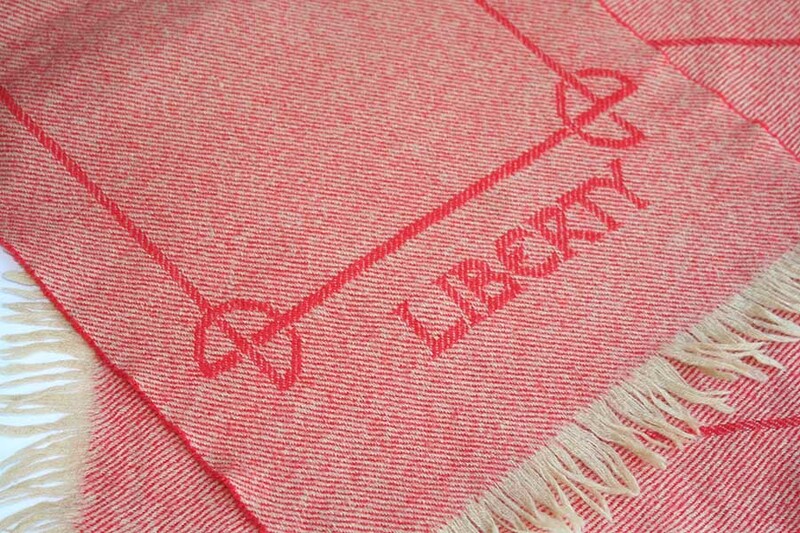 Liberty’s scarf department has become a visitor attraction and designer scarves are increasingly regarded as investments. An evening with renowned designer Georgina von Etzdorf at London’s Fashion and Design Museum as part of its recent Liberty in Fashion exhibition was completely sold out, testament to her influence on our style and how she has helped the scarf become a key item in our everyday wardrobes. FASHIONABLE WOMEN the world over couldn’t get enough of the Georgina von Etzdorf label, especially its luxurious velvet devoré scarves. By the mid-Nineties the company, created and run by her and two art college friends, was selling in 400 shops in 25 countries, with concessions in Selfridges and Barney’s in New York. It was even said that copying of her creations helped create a worldwide shortage of velvet. Diana, the Princess of Wales, was photographed wearing the poppy print fabric, while David Bowie and Mick Jagger were said to favour the label’s fine crepe Volare tulip-print scarf. There were beautiful shops in Piccadilly’s Burlington Arcade and off Sloane Square, and endless fashion shoots featuring the ‘boho chic’ scarves. FROM EARLY days mixing dyes in a Kenwood blender at her parents’ Wiltshire house, to the fledgling business trio taking turns trying out their selling skills with a suitcase full of stock at potential shops, variously chain-smoking and shaking with nerves… von Etzdorf held her Fashion Museum audience enthralled with stories from the early days of the company. Those were the days – they graduated in the late Seventies – when the business component relating to future careers was largely absent from the curriculum at art colleges compared with today’s offering. Textile design student von Etzdorf, her fellow Camberwell College of Art student Martin Simcock and his schoolfriend, Central St Martins product design student Jonathan ‘Jimmy’ Docherty, remain close friends, almost a decade after very reluctantly deciding to shut down their company in 2006, after 25 years. Introducing her at the Fashion and Textile Museum, the director Celia Joicey wore a GvE scarf she’d been given for her 21st birthday and most of those gathered for the designer’s visit paid tribute by wearing something from her creative output over a quarter of a century – scarves, mostly, but also ties and some richly ornate velvet jackets. The next exhibition at the Fashion & Textile Museum is Marian Clayden: retrospective of luxurious art textiles, 11 March – 17 April 2016. VON ETZDORF talked for nearly two hours, generously and often humorously revisiting the history of the company, the highs and the lows, along the way flagging up lessons learned. She spoke of the day when, still a student, she was jubilant after selling some designs to Liberty. She returned to college ‘thinking I was on Cloud Nine, I’d made it!’, only to be told by the head of the department ‘Oh no, that’s terrible! You must always hold on to your work. 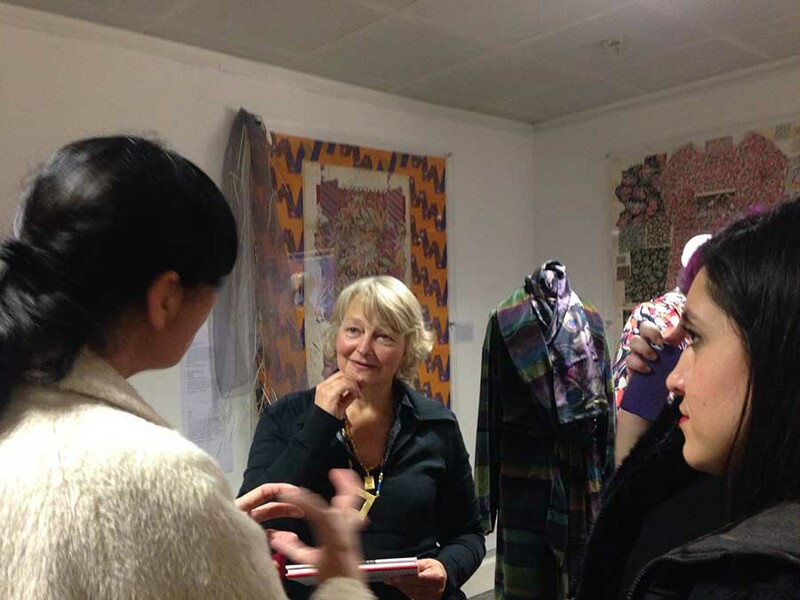 It’s very important to have a record.’ At her final year end-of-term show she sold another ten designs to the store. Recalling that she’d ‘never seen very many’ of those designs, after her career took off she went back to the person she’d sold them to and asked to buy them back at the original price. 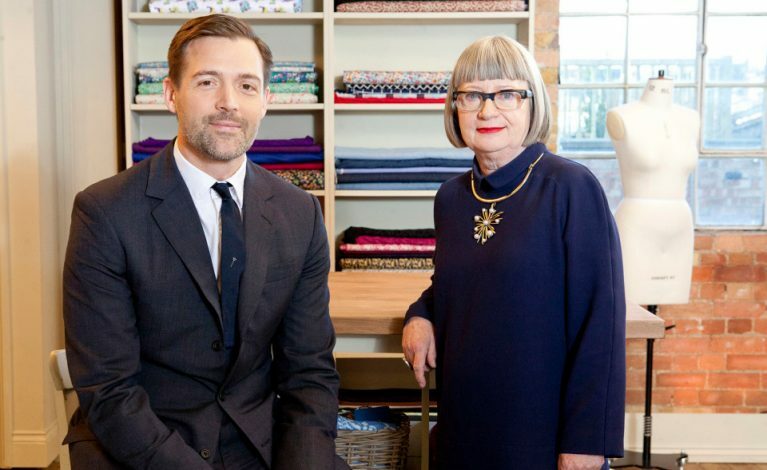 ‘He said he had no idea of where they were.’ When she and Jimmy started the company in 1982, they began selling to Liberty with their first scarf, in the company’s Poppy design. Von Etzdorf related how her father had sat her and her partners down in the early days and asked them to write down ‘a list of all the things you think your company is about’, with a view to talking to them about business. She remembers them writing ‘things like ‘beauty, justice, vitality, truth’. Very noble, said her father. Anything missing? The trio thought. One of them said: ‘Holidays?’ Mr von Etzdorf pointed out there had been no mention of money. Almost immediately, though, their scarves started selling in Bergdorf Goodman in the US, and soon other major American stores, thanks to the store buyers having scouts in the UK and Europe on the lookout for what would sell to their customers. 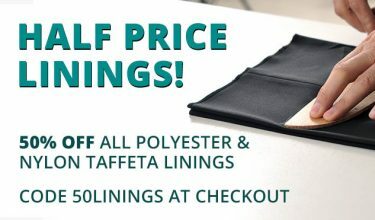 The company continued to grow, diversifying into other products including dressing gowns in sumptuous fabrics and colours for evening, ties, umbrellas…. They showed at the very first London Fashion Week in 1984, putting products into collections according to colour and extending the offering with different fabrics – chiffons, silks, using laser printing and other techniques. Just as the company was getting back on its feet after this downturn, there was worse to come, with the 9/11 terrorism events of 2001 in the US. She says forward orders were cancelled, items weren’t returned, others weren’t paid for. They picked themselves up yet again, and gradually started selling through trade fairs. Four years later the London bombings dropped another blow on sales and by 2006 the three partners felt they couldn’t pick themselves up again and decided to go their separate ways commercially. ‘It was like being in the boxing ring, being knocked back each time,’ she remembers. The end was bittersweet, as September that year also saw the accolade of a huge retrospective of the company’s 25 years of Sensuous Textiles at Manchester Art Gallery. Von Etzdorf spoke of her and the company’s drive for constantly creating. Even when finances were tight and they couldn’t afford the raw cream or white fabrics onto which they printed (except for velvet), they turned to recycling stock they had already produced. ‘We were at our most creative then, in some ways, still producing beautiful things’. Her expertise in creating and producing new fabrics and ways of using them, combined with her love of painting, colour and movement, were key to the company’s huge success, resulting in breathtakingly beautiful designs and fabrics in striking colours. During her talk she was at her most eloquent and fascinating when explaining her complicated processes, and how she constantly experimented and adapted, especially when money was tight. The original plan had been largely to design the fabrics for a third party, but commercial printers proved unwilling or unable to work with the fragile or more unusual fabrics Georgina as design director wanted to use. She was appointed a Royal Designer for Industry (RDI) by the Royal Society of Arts in 1997, among her other awards. For her, she says, it has always been about colour and movement. She looks back at her early childhood, spending the first five years of her life in Peru, as a huge influence. If I were to produce a brief list of words about Georgina von Etzdorf, I’d include ebullient, warm, gentle, bubbly, down-to-earth, resilient, creative, stylish, very hard working, measured, calm, self-effacing – and also somewhat vulnerable. As she related their story, we the audience became increasingly aware that she – and obviously her two business partners – have been through a lot. When asked by a member of the audience what she’s been doing since the label closed, she says she did nothing for a year. ‘I felt wiped out by the whole process. It was Go! Go! Go! The fashion industry was so demanding.’ The nuancing of the collections, for example, not simply in the designs, colourways and fabrics, but that they also had to be different from the previous but not too different in order not to alienate the core customer. Georgina von Etzdorf ended up with her name on the company’s labels, she said, because after six months of brainstorming a name ‘that embodied the three of us and what we did’ they all decided hers ‘sounded a bit like a designer name’. While she was the main design arm, her partners were mainly responsible for the selling and all three kept the show on the road. The fashion landscape has changed considerably in the 35 years since they launched, and even in the decade since they were forced to shut shop. ‘That was very brave of her’, said a friend of mine when I mentioned that I’d been to hear von Etzdorf speak. My friend, whose own well respected British fashion firm rose and then fell in the same era, has moved on but the memories are still painful. Her talk ended with a rush to the front of the room, at von Etzdorf’s invitation, where we were allowed to touch, examine, praise and sigh over the archive stock she had transported in a large vintage suitcase bearing the legend ‘Georgina von Etzdorf – England’. Fashion editors, students, fans, all wanted to meet her and speak to her. Several asked if she would be having an exhibition at the Fashion Museum – she’d told us there is an enormous archive in storage. How lovely it would be to see it in London, beautifully curated and in its entirety. And with books and chic mementoes to buy from the museum’s gorgeous little shop. Or the V & A, perhaps? It may be only then that the Georgina von Etzdorf Partnership is truly recognised for its artistic output, innovation and influence. And also why scarves play a huge role in our fashion armoury, and velvet is no longer just for evening wear. 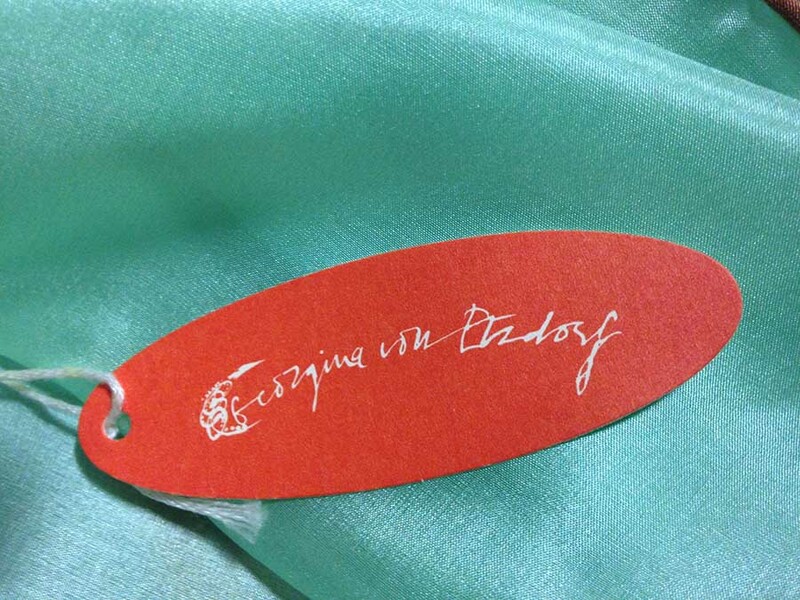 Georgina mentioned that there are occasionally scarves from her archive on sale via her website here, You can occasionally also find Georgina von Etzdorf scarves and other items on Ebay, Etsy and other buying/selling websites. It’s harder to get hold of dressing gowns – I’m still trying!! You can find new GvE ties, pure silk, handwoven and handmade in the UK here. There is a book from 1998, Georgina von Etzdorf: Sensuality, Art and Fabric (The Cutting Edge) by Nilgin Yusuf, ex-fashion editor and now Programme Director within the graduate school at UAL London College of Fashion. At the time of writing, Amazon had a few used and new copies. THE UNUSUAL name Pookie Blezard meant nothing to me before researching this blog – but I’ve since learned that she’s the person behind my favourite, most precious scarf. Bearing the label Pazuki, which I somehow imagined might be Japanese, I bought it at Liberty possibly ten or even 15 years ago. I was distraught having just lost my favourite, so thought I would make up for it by saving up and treating myself to a really special replacement. For me scarves, unlike lots of clothes, never go out of fashion. I looked for ages, stalking new arrivals in Liberty’s scarf department, which I figured would be the best hunting ground. And I was rewarded with my beautiful furry-velvet and silk, pinky-brown number with appliqued lace, some sparkle and tiny beads. If I go out, and decide to take it off, it never goes over my chair in a restaurant or cafe – always straight into my bag before I’m ready to put it back on. It’s not that it cost around £150, and may be a future heirloom. I just love it, it’s special. 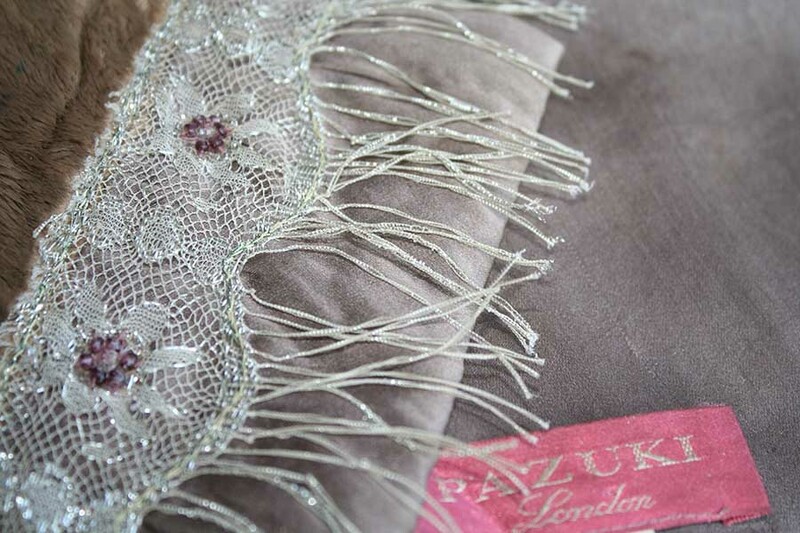 And now I’m thrilled to learn that Pazuki (or Pazuki London, properly) is an English company created by another student of the Camberwell course that produced Georgina von Etzdorf and textile designers Helen David of English Eccentrics and Neisha Crosland. Others are also clearly fans of what she terms the ‘artsy Bloomsbury style’ conjured up by old Pazuki prints – in the Pazuki blog Pookie tells how she nearly jumped out of her seat while she was watching The Danish Girl movie, in a scene with actors Alicia Vikander and Eddie Redmayne. ‘She was wearing a dress made out of scarves I designed in the Eighties called ‘Library’. She has no idea, she says, where they got the fabric from. 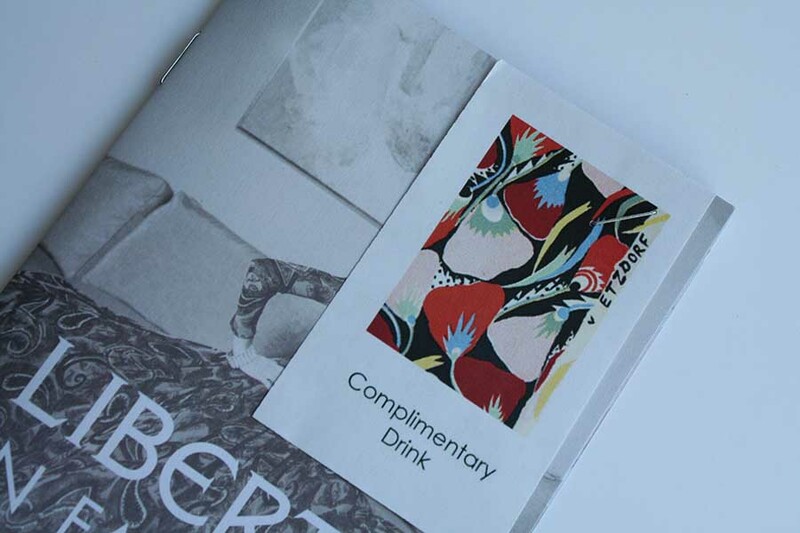 ‘We only ever printed small runs for a handful of stores.’ Paul Smith discovered them and this led to Pookie designing prints for his collections. The same print was also bought for the BBC’s House of Elliot period fashion drama and later exhibited at the V & A. The designer has one remaining piece. 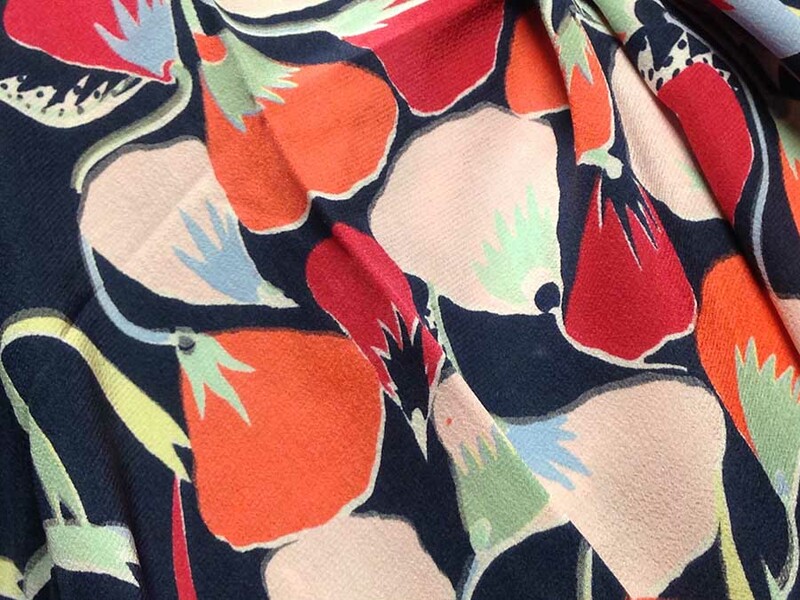 Go to pazuki.co.uk for the online shop, with some wonderful scarves in various fabrics, including wool, and a range of clothing including velvet coats. Pookie is also a great photographer, so it’s worth checking out her blog posts on various subjects, especially on aspects of London. LIBERTY, REGENT STREET’S world-renowned scarf collection is a glorious one-stop shop, with offerings from most self-respecting top designers and prices to suit most budgets. Whether you visit in person for the full experience, or window shop on the Web, you’ll find names including Vivienne Westwood, Rohka, Etro, Me and Kashmiere, Pierre Hardy, Christian Lacroix, Givenchy, Balenciaga, Stella McCartney, Mary Katranzou, Marc by Marc Jacobs and a large selection from Liberty London. For the purposes of this piece I counted up and found 341 scarves on sale online, although in terms of ‘most budgets’, all that was in the lowest budget range, ie under £60, was a pack of Liberty scarf styling cards at £15. For £65, in either gold or silver tone, you can buy a Liberty London scarf ring (or even better, buy an unusual new or vintage brooch). There were a dozen priced at more than £500 each and the highest price tag was on a gorgeous Valentino gold lace cotton-Lurex scarf for £960. If you’re wondering about different ways to tie it (a girl can dream…. ), head to Liberty TV for scarf tutorials from in-house ‘scarf stylist’ Lauranne Plat. Visit Liberty’s website for more. STARTING OUT as a luxury scarf designer may be a daunting prospect if it’s a career change. Emma Greenhill does have some advantages, though… She went to Paris on spec to find a job after studying fashion and textiles more than 20 years ago. She talked her way into fashion PR, ended up working for top designers and then running her own company. Now, though, encouraged by designers Hussein Chalayan and Julie Verhoeven, whom she met when working at John Galliano, Emma has returned to her native Scotland and set up a beautiful shop online, showcasing her own creations. Her bold, bright and splashy prints, which originated as kitchen table paintings, are fresh and memorable and worth investing in – the price tags reflect the top Italian manufacturer and come in a cashmere mix, fine wool and silk, hand-finished and for both men and women. 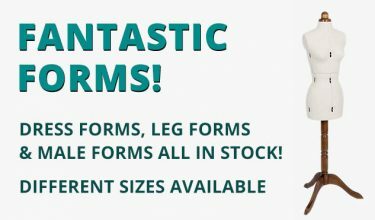 Particularly striking are the Elephant Paisley and All Eyes designs. Further info can be found here. ONE OF the most famous names in scarves is the French fashion house Hermès, whose scarf collection has grown in size and scope with the appointment in recent years of Bali Barret, artistic editor of Hermès women’s ready-to wear and accessories. She has been known to use a scarf to hide an ugly picture in a hotel room and as a teenager fashioned larger scarves into miniskirts. Her role has included helping come up with thousands of new scarf designs in collaboration with a variety of artists from different walks of life. Last year Hermès launched its digital site, as well as its own Instagram feed. 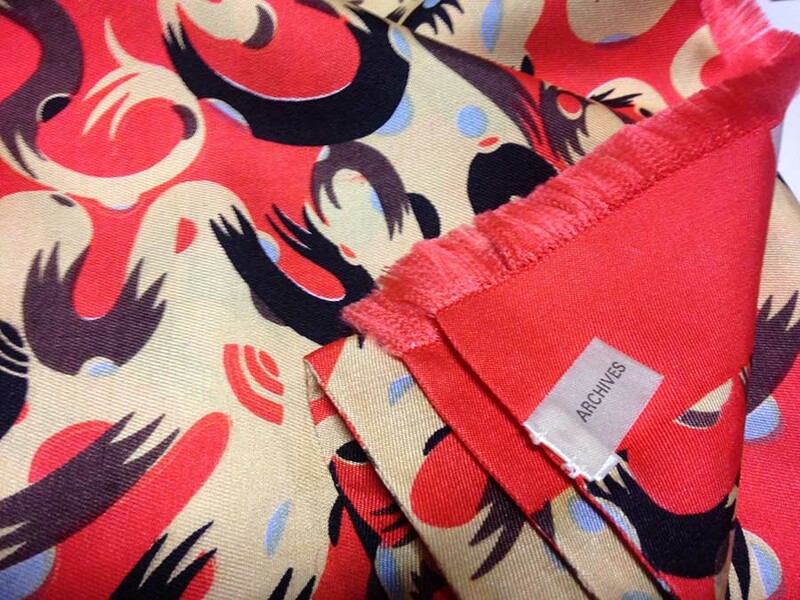 The site itself is beautiful, with the familiar whimsical illustrations by Pierre Marie and scarf upon gorgeous scarf. Interestingly, the company also offers a large range of pashminas – Georgina von Etzdorf mentioned meeting a senior Hermès figure at a business event during the ‘pashmina era’ and he said that the pashmina had dented their sales. In this new era, the goat-hair and the silk squares are now sold side by side. CHARITY SHOPS are fantastic resources for scarf hunting, especially vintage ones. 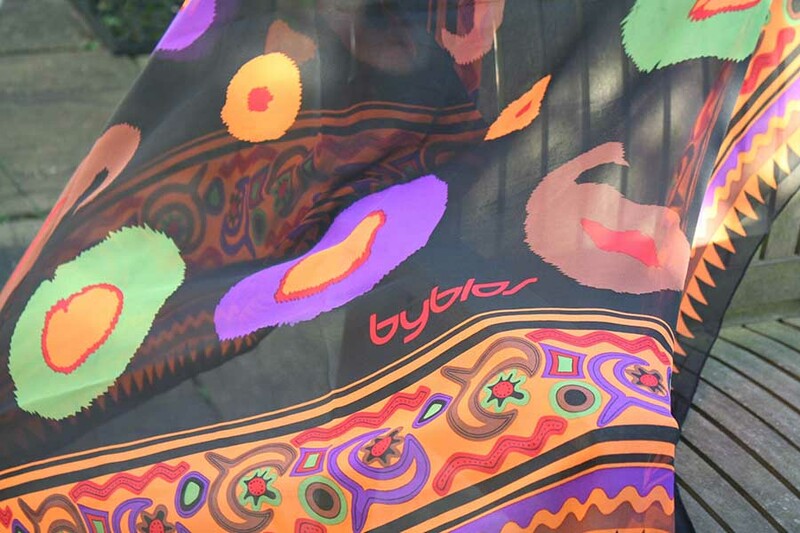 My sheer large multi-coloured scarf from Italian fashion house Byblos was given to me by an Italian friend, a former buyer for a chic London department store who haunts second-hand shops for interesting clothes and jewellery, and has some great finds. I’m finding it hard to date but am hoping a bit more research will reveal it to be from the era between 1981 and 1996 when the company’s design was courtesy of the Brit ‘dream team’ of Alan Cleaver and the late Keith Varty, fresh out of the RCA when scouted to work for Byblos. Lots of colour, brights and a touch of humour were their trademarks. If anyone reading this recognises it, please let me know! 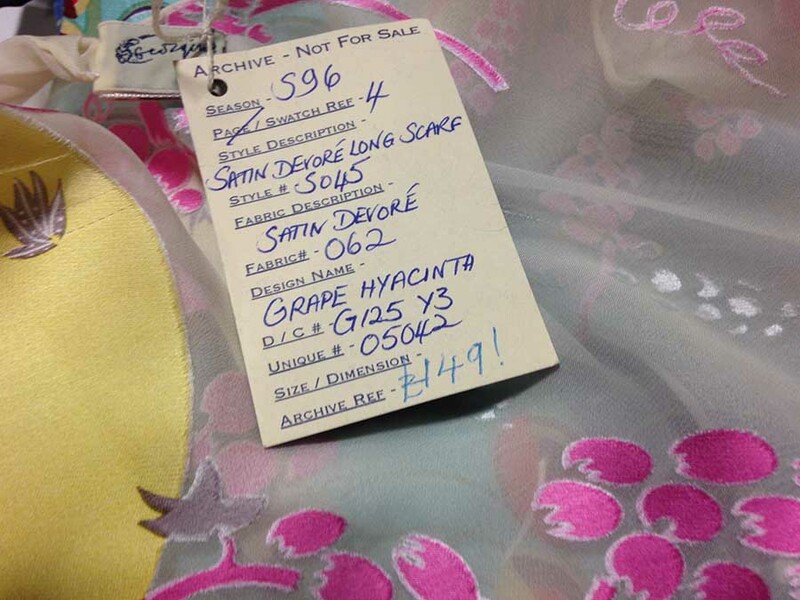 It can be difficult dating scarves and finding out more about them. An unusual one of mine that always gets compliments when I randomly wear it is my Kenzo ‘headscarf’, actually a huge square with an historical portrait of a young man at the centre, surrounded by a border of flowers. A gift from my sister in the US around 20 years ago, I’d love to know who designed it and what their inspiration was. Ebay is always a good site for finds – I found this fringed peachy/orange vintage wool scarf from the Eighties, with the Liberty name in its familiar Arts and Crafts font, for just under a tenner. 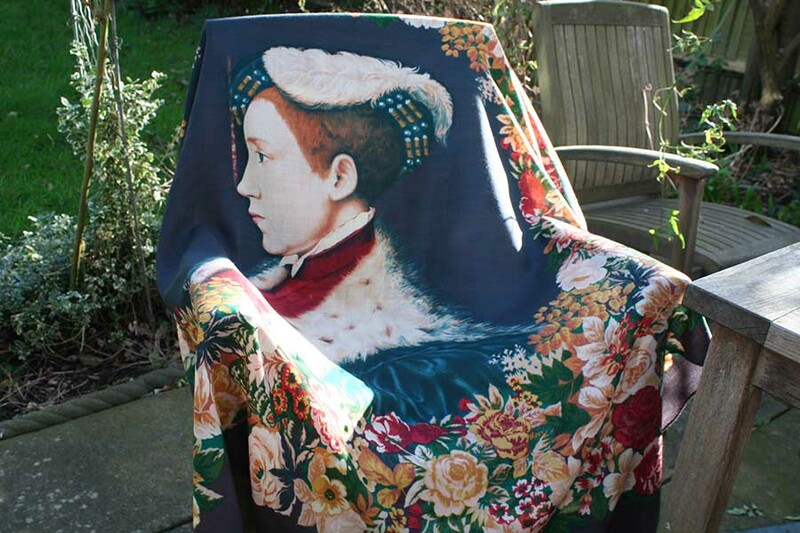 Etsy is also good for second-hand and sometimes new modern and vintage scarves. 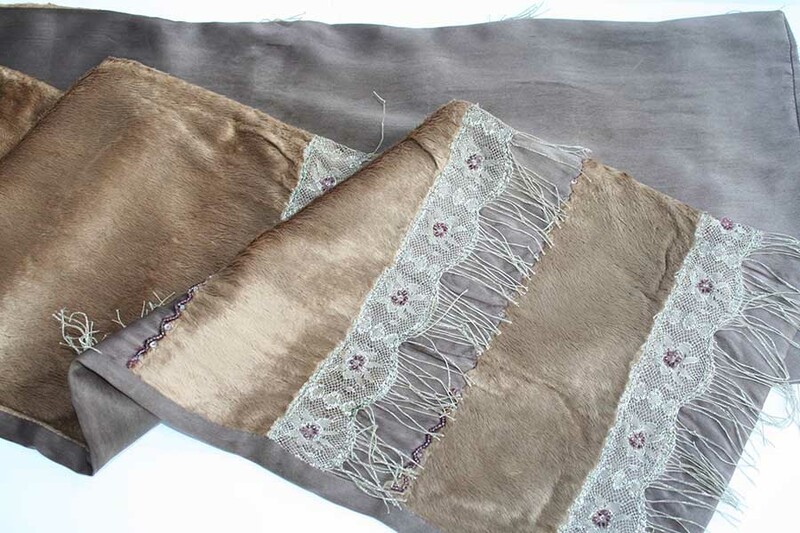 For rarer and more unusual vintage scarves (and expect to pay more for something truly special) try 1st dibs. Scarves are simply another way of making or buying art, whether the value is in the materials, the artwork, the couture hand-finishing skills, the ideas behind the scarf, or the whole package. I’m off to look for a Georgina von Etzdorf online…. What’s the story behind your favourite scarf? Let us know about your scarf collection in the comments below! a type of cloth or woven fabric.